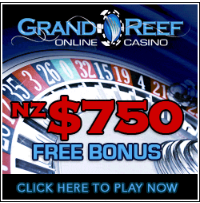 Here at Online Casinos NZ you’ll find basic infomation on the most popular Online Casino games… We also include links to play the games in demo mode – playing the games for free is the best way to learn! Baccarat offer the player some of the best returns of any casino game, so it is worth checking out. It’s extremely easy to play and a lot of fun. Blackjack is the most widely played game in online casinos, mainly because it has such a good return for the player. You can read more about blackjack or start playing for free. Casino Hold ‘Em was devised in 2000 and has since become a Casino favourite worldwide.Based around poker hands the player plays against the house. Caribbean Stud Poker is a Casino card game that is based around five card poker hands, but rather than playing other players you are pitted against the house. Craps can be as easy or as complicated as you like. There’s loads of rules, tips and strategy to learn if you are so inclined… Or you can roll and hope! Roulette is acasino classic is a favourite with us Kiwis, it’s a simple and fun game to play with a whole host of betting options that extend far beyond simply betting red or black. Slots are probably the most fun game in the casino, and your best chance to win BIG. It may not offer the frequent returns that blackjack does but it does offer big ones! Three Card Poker is a fun and simple version of traditional five-card poker, this game offers players the same excitement with less pressure. Video Poker gives the player a great opportunity to win a little, often, it’s a fast-moving, fun game with loads of variations.